Some of what happened between 5.17 and King’s cameo is related by Raven during the events of The Dualist. As a chain of events it doubtless has a lot in common with Animal House, if Animal House was full of cyborgs and spacecraft and automatic weapons. Inferred, but not explicitly stated: when Beef loses his head, he loses a good-sized chunk of time. It has something to do with cellular regeneration and his enhanced physiology. King’s shirt decal was a last-minute addition – same with the camo, which exists in panel two but is covered by dialogue. Panel one isn’t gonna win any awards (front-on shots being something of a weak spot, given my interpretation of noses), though I’m pretty pleased with King’s appearance in panel three. And his cameo as a whole – just as snarky as his cameo in The Dualist, and a lot less vulgar. Beef’s Horatio Cane moment is all the vulgarity this page needs, really. Speaking of Beef – compare his appearance in Earth -42- to his appearance on this page. There’s four years and 12 days between those two pages… and just a tick under seven years between this page and the first page of DCR that features line art. Either comparison shows one hell of a difference. My comments at the end of The Dualist – Subversion -38- (19 July 2007) or Interstitial -4- (14 September 2007) depending on how you look at it – are terse and dry. This block of commentary ain’t terse, not by a long shot. I recall being chronically exhausted at that point in time. Five years later my situation has changed quite a bit. I’m still struggling with a few of the same ordeals and comic production is still very much an All Day or Late Into The Night affair, mind you. One thing that’s changed for the better is that ATC as a body of work is damned near ready for prime time. I’ve got the production process pretty much down pat – promotion is the thing I need to get a handle on, and I plan to start work on that at some point before the end of the year, after an editing pass on the work to date and after a massive and much needed overhaul of the website. I’m not talking graphics and functionality fixes – I’m talking re-thinking the entire site from the ground up. With an eye towards ATC as it is now (as opposed to as it was in… whenever the present navigational framework was a step forward), how ATC appears to someone who’s never heard of it, etc. That kind of overhaul. I’ve mentioned an editing pass once or twice. This won’t be a Second Edition editing pass – we’re talking a re-read with an eye towards continuity, a few hopefully small dialogue tweaks, and some art tweaks. I’m bouncing back and forth between One Major Art Fix Per Page and Just Whacking What Bugs Me – the shape this round of edits will take won’t be known to me until it gets rolling. It won’t be a multi-year Hold. It’ll be done in a month or two Or Else, and it’ll mainly be an excuse to implement a revised Dualist logo (that still needs to get into the design phase), address a few nagging issues that have been bugging me for the past couple of weeks/months – and at least one planned fix for something xeno grumped about a year or two ago. When it comes to continuity I need to take a hard look at dates, both on the page and in the Universe section. A study of captions, their use and consistency (internal to each book). And… other things. Leaving September and possibly October (but hopefully no more than that) to tighten the bootlaces, and the rest of Q4 for development of the website, TV.2 script, and assets. While I could easily add another 10-30 pages (front and back), at this point I consider Dead City Radio to be complete. The comic, anyway – the book (which contains and pretty much is the comic) still needs the cover. Otherwise… I’ve just wrapped Principal Photography (so to speak) on my second graphic novel – and the vast majority of DCR was produced within the past two and a half years. I plan to bring Transitional Voices home in fewer pages – considering the state of TV assets and what I’ve learned over the course of grinding out DCR it should be possible to bust out eighty or ninety pages in two years. Less if things go well – though invoking the requisite conditions will require the kind of effort that makes what I went through to get ATC into production look like a trip to the mini-mart. If I can invoke those conditions, whoo. TV has been on the back burner for four years and it wants OUT. Out so friggin’ bad I’d have a working script right now and would be leaping into pre-production tomorrow if it weren’t for that pesky money thing. DCR The Comic is DONE! DCR The Book has ONE web-facing page left! Feeling pretty good about the comic – it’s come a very long way in the last couple of months. I’m looking forward to getting the boot lances cinched up and I am absolutely SCARED SHITLESS of the Known Unknowns – what I’ll need to learn, what I’ll need to do to get this thing to print and/or get a healthy volume of eyeballs on it. I should probably post this already. 2012 08 05, 20:17 – Pondering retooling the layout for a Big Damned Hero shot of Beef in the last panel. Depends on how I’m feeling when it comes time to render – as of now the layout crutches pretty heavily on The Dualist, only with a better-drawn head. 2012 08 11, 16:13 – Managed to get the page into renders early Saturday morning following a massive Critical Existence Failure that began roughly 2pm Thursday, peaking around 3am Friday. 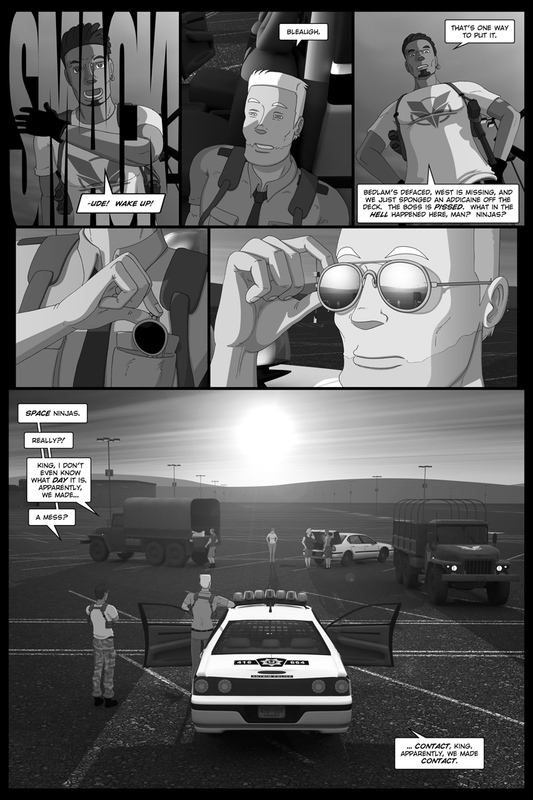 At this point the first five panels – slap through sunglasses – are rendered. 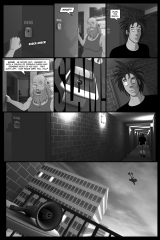 The last panel is rendering and the page should be ready for line art today or tomorrow. When it actually gets drawn is anybody’s guess at this point – the CEF did serious damage to my work schedule, at least one work relationship, and possibly a number of acquaintances. As far as meltdowns go this one was a fairly typical flat-out Irrational Rage – the only real silver lining is that it was focused on booze quality-to-price ratio as opposed to relationships or other nebulous emotional issues. The booze thing is an easy fix – I’m back on the wagon. The end. I doubt it will last but it doesn’t really have to – if I make it from this section of the entry to the end of the chapter dry, then I stand a good chance of staying that way for awhile. Somewhat related – most of TV.2 and a chunk of TV.4 now have 2012 drafts. It’s good material. I’m happy with the general tone and overall quality, though not the price I paid to get it. Not the cost in money – throwing myself at TV development as a form of escapism exacerbated a mental state that was already ripe for a CEF. It didn’t induce the damned thing but it definitely helped hasten the arrival. 17:58 – Last panel has a lot in common (compositionally) with descent -22- and earth -42-. While there’s certainly a lot more going on in this shot, the similarity does make my brain itch a bit. The fact that the DCR.5 page plus the Dualist.6 page adds to the TV.1 page offsets that nicely. Also, rendering complete. 5.19 and 5.20 are ready, only one panel of 5.18 has been rendered. I should be able to start on the CG assets tonight or at some point this coming week – the work involved is fairly straightforward, requiring detailing of only two small pockets of Thad’s apartment if I don’t go overboard. Next addition to this page file should be the “Ready for line art” notice, then the line art production leg. 2012 08 17, 04:04 – Pencils finished roughly 25 minutes ago. Torn between inks and bed. This thing’s getting inked today – it’s just a question of AM or PM. 05:23 – Inked and scanned. Line art file assembly then bed. Cleanup Friday afternoon. 16:15 – Inks are go for cleanup. Afternoon supply run head-time spent rattling between some sort of journal comic and resurrecting another project from the 1990s as a possible comic thing – an offshoot of recent comic reading and the realization that I can “fix” some major physics landmines in The Dualist by restricting NBEs (and NBE “physics”) to “annexed” realities. 20:19 – Cleaned up, starting on flat colors, have to pee. Fun fact: King’s TMP-45 wasn’t digitally re-inked, though it did get the same straightening-up that all line art gets. Also, MOAR CAMO. Why the hell not? Oh, and a TF2 break before assembly and shading. Mann Vs. Machine trials on a private server – protip: if your team is under-Manned, you can’t go wrong with an engineer. Assuming you know how to play one – the twenty or so minutes of gameplay and most of that was remembering what the Buttons That Aren’t WASD Do. 2012 08 18, 00:16 – Down to shadow detailing of the last panel. Feels like time has Stopped, even though it’s breezing by. The comic production equivalent of performance anxiety, possibly. Flip side or possible comedown of the Great Idea Surge I’ve been surfing for the past week or so, also possibly. 01:27 – Art complete (or rather, down to nit-picking). It’s the script that’s bugging me. Time for a last minute rewrite! 02:09 – Added four new lines of dialogue, expanded the last one. Tweaking. 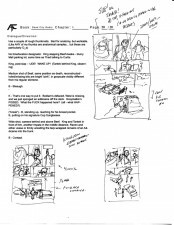 Mastering notes, 2016.12.08 – Minor tweaks to line art in panels five and six. The Templar-issue Sedan is just as robust as the Beefmobile, though it trades the siren for seatbelts and the police decals for a more innocuous paint job. That’s a good point you raised at the beginning…is Beef’s brain physically located in his skull? Or is it on a parallel plane in the same spatial location? While a regeneration complex is one thing…is it technically possible to retain any knowledge/memories from a vaporized containment unit? I prefer to leave the technical aspects of Beef’s regenerative capabilities as vague as possible – to the extent that I’ve thought it out, he has a very decentralized nervous system, with aspects of higher cognition being continually “backed up” into the rest of the body and “restored from backup” as required. Anatomically, he has more in common with the typical fantasy troll than he does, say… the T-1000. 132 queries in 0.888 seconds.